Joe was a brilliant actor who had been nominated for the best actor award in an award ceremony. He had worked hard and his movie had done very well. When the announcer announced that he was the winner, Joe felt a cocktail of emotions- he was joyous, inexplicably sad, relieved and excited all at the same time. With partially moist eyes, he got up from his seat and went to collect the trophy. As soon as he held the trophy in his hands, a feeling of panic rushed through him. He felt like a fake. He felt he didn’t deserve the award and that he had somehow tricked the people as well as the judges into believing he was a good actor. He was terrified that his mask would finally fall off and the real him would be exposed for the world to mock and ridicule. What Joe felt has come to be called the impostor syndrome, sometimes called impostorism, and research suggests that this feeling is fairly common.1 It is common in high achievers and even Einstein reported that he experienced such feelings. People experiencing impostor syndrome feel they’re undeserving of the level of success that they achieve. They’re constantly afraid that they’d be exposed for the frauds they think they are. There’s a voice in their head that screams, “THIS IS NOT ME!” whenever they achieve or set out to achieve something extraordinary. Our psychological identity is a set of beliefs that we have about ourselves. Our life experiences and interactions mainly shape who we think we are. We form certain rules about ourselves and then adhere to those rules. The problem is: many of those rules are formed at an early age when we don’t have much control over them. We can't challenge or question them. So we accept the ideas about ourselves from our parents, teachers, and society in general. If influences from your social environment managed to convince you that you’re undeserving of success, you form this image of an unsuccessful you in your head and believe that's who you are. Who else would you believe but those around you? The constant criticisms of your parents and teachers, their lack of acknowledgment when you do well and their discouragement when you try something new- everything contributes to your self-image. Therefore if deep down you feel unworthy of success, impostor syndrome will kick in whenever you excel or try to excel at the things you think you can’t excel at. Impostor syndrome is not limited to just career-based achievements though. You can experience the same feelings in social interactions and relationships when your self-image isn’t consistent with what you’re becoming or trying to become. Impostor syndrome is the result of a conflict of identities, with a long-held identity trying to overthrow the new, fake mask of an identity. Whenever there’s a conflict of beliefs- in this case, beliefs about the self- cognitive dissonance ensues. The discomfort caused by the conflict and the cognitive dissonance forces the person to resolve it. People resolve the internal conflict created by impostor syndrome in interesting ways that all revolve around trying to compensate for perceived inability. 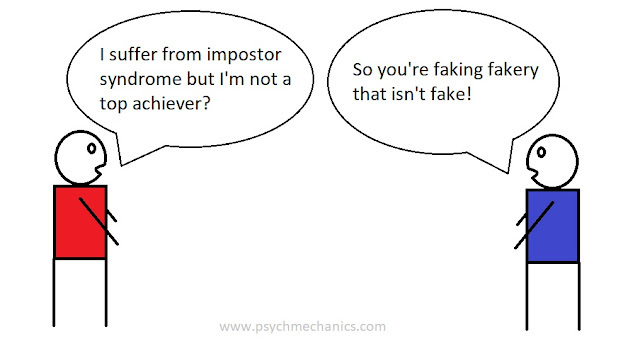 For instance, people experiencing impostor syndrome are likely to become perfectionists. Perfectionism lets them set impossible goals for themselves so that they can hide their self-doubt from themselves and overcompensate for it. After all, those who feel they can’t do something have a strong need to prove that they can do impossible things. The strategy usually backfires because the person is often unable to reach the impossible goals and this reinforces their self-doubt. Similarly, people with impostor syndrome may become workaholics in an attempt to be better than others because they have a feeling they’re not.2 In a nutshell, those with impostor syndrome are engaged in this constant battle of trying to prove their self-worth because they have low self-worth, to begin with. When they do succeed, they tend to blame it on external factors such as luck because they don't believe they're themselves able. But is it all really as bad as it sounds? Impostor syndrome is bad for you only if it stops you from trying new things and going after success because it does a have a tendency to that, you know, in its attempt to pull you back to your previous self. At the same time, extraordinary achievements are rarely possible if there's no strong drive for it- even if that be in the form of impostor syndrome. A child whose parents lauded their every little accomplishment may become satisfied and complacent as an adult and lack the drive to achieve extraordinary things. Also, more often than not, we feel the things that we feel for good reasons. It’s possible that you’re experiencing impostor syndrome because you’re unprepared for the challenge you’re about to take up. It’s not that you don’t believe you can be successful in general but that your mind thinks you’re unprepared to deal with this specific problem that you're facing. In these contexts, impostor syndrome should be seen as a useful warning signal from your mind trying to motivate you to be better prepared. If I had to summarize how one should go about dealing with the feelings of impostor syndrome, I’d say keep these things in mind: Many super successful people have experienced it; you don’t have to linger on to your previous non-useful identity; focus on the things that you have done well and received accolades for. It can be an effective way to silence the noises of your previous identity. Lastly, prepare yourself well for the challenges ahead. If you’ve accomplished things in the past, you can certainly do the same in the future. 1. Sakulku, J. (2011). The impostor phenomenon. International Journal of Behavioral Science, 6(1), 75-97. 2. Young, V. (2011). The secret thoughts of successful women: Why capable people suffer from the impostor syndrome and how to thrive in spite of it. Crown Pub.